Ok guys, I think I may be in love here. This Vegan Apple Galette is like a pie you can eat with your hands! It’s basically like a dessert pizza. I love dessert. I love pie. I love pizza. Basically all of my favorite things have converged here making to form the world’s most ready to eat pastry. This may or not be a good thing seeing as I ate every single test version of this Vegan Apple Galette and the final version as well. Usually in less than a day and always without a fork or even a plate. But it’s healthy if it’s vegan, right? RIGHT? At least that’s what I tell myself. Side note, I recommend sharing this Vegan Apple Galette! Combine the pastry flour, sugar, and salt in a food processor. Pulse a few times until even. Add the vegan butter and pulse 12-15 times until butter forms pea sized clumps. Slowly stream in the ice water while pulsing. Continue pulsing until the mixture looks even, but stop before it forms into a solid mass. Form the dough into a ball in your hands, then roll it into a large disk on a floured surface. Cover with plastic wrap and refrigerate for 1 hour. Preheat the oven to 400°. On a lightly floured work surface, roll out the pastry to a 12-inch circle and transfer to a large rimmed baking sheet. Spread the chopped apples over the pastry to within 1 inch of the edge. Drizzle the agave or maple syrup over the chopped apples then sprinkle with orange zest and allspice. Decoratively arrange the apple slices on top in concentric circles or in slightly overlapping rows. Sprinkle the cinnamon sugar evenly over the apples and dot with pieces of vegan butter. Carefully fold the pastry edge up and over the apples to create a 1-inch border, pinching together any cracks in the crust. Brush the non-dairy milk on the edges of the crust and sprinkle with a bit of sugar. Bake at 400 for about an hour until the apples are soft and the crust is golden brown. Transfer to a wire rack to cool. Serve with Salted Caramel sauce and non-dairy ice cream, if desired. Add all ingredients to a blender and process until smooth and even. The whole wheat pastry crust can be made up to 2 days ahead and stored in the fridge. Let sit at room temperature for 15 minutes before rolling out. This Vegan Apple Galette is sweet, flaky, full of perfectly baked apples and tasted absolutely incredible with non-dairy vanilla ice cream and Salted Caramel Sauce. If you’ve never made caramel from dates before, this may be your new favorite dessert idea! Expect to see many different versions of this sauce in our upcoming recipes. It is SO YUM. 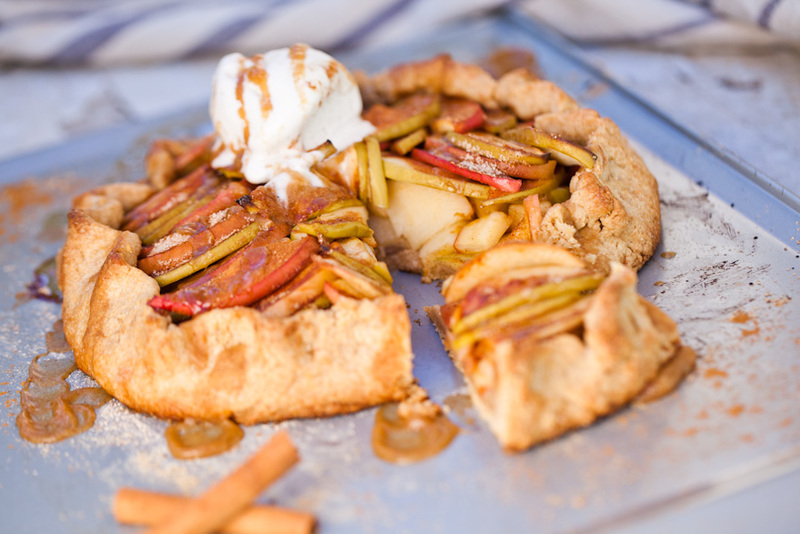 If you tried this Vegan Apple Galette recipe, leave us a comment and tell us about it. While you’re at it, why not post a photo to Instagram with the tag #carrotsandflowers? We wanna see what you’ve been up to in the kitchen! For more fruity, delicious vegan fun times like this Vegan Apple Galette recipe, be sure to check out our Pink Lemon Meringue Pie and our Raspberry Lemon Layer Cake! To save this Vegan Apple Galette recipe for later, simply pin the photo below! you say in the instructions to peel the apples yet the photo shows unpeeled..(it does look prettier unpeeled)? which are you supposed to do peel or not?